Content Notice: Xenophobia and racism. …Probably tells you all you need to know about their priorities. Also, judging by the hashtags, “back to where the poster-maker came from” is probably Europe. Just a hunch. So, you first buddy. Earlier today, disturbing racist posters were discovered on our campus. As soon as they were brought to our attention, the posters were removed. Any new posters found will also be removed immediately. 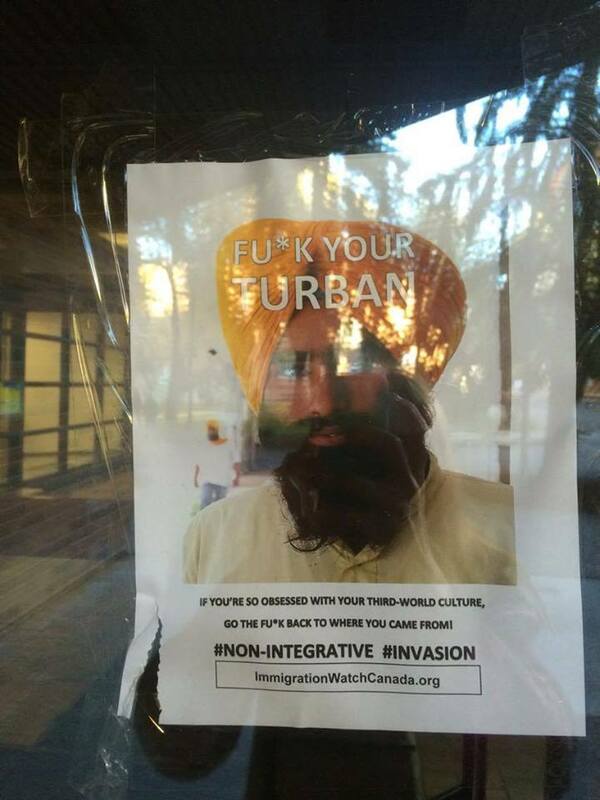 Unfortunately, similar posters have also been found on other Canadian university campuses. We are working with University of Alberta Protective Services to find the parties responsible. The University of Alberta is a space that is open to all people and we take pride in the strength of our diverse community. Sikhs have been in Canada since 1897. I’m so sorry I can’t link to the result page because the first image is of a Rembrance Day ceremony. One of the participants is wearing a kilt. And a turban. I had a man, an immigrant from Norway, tell me, in his heavily accented English, that all those “ragheads” should go back where they came from. He didn’t like me telling him that their grandparents were here before mine were. Only difference; mine were white. Reminds me of a family get together where I was the only person vocal against the use of the N word. Later, someone chastised someone else for using a regular swear word (maybe the F word) in front of the young person who had been in the room the whole time. You’re not going to dump your racist shitheads on this continent. 1st, we have our own racist shitheads. Our shithead capacity is more than full. 2nd, your society created them, you deal with them.